Well, we finally did it. After two years of talking about it, we got a quorum of stitchers together, sliced and diced a whole bucket of rayon, and viola! A whole deck-railing full of rayon scarves. Which the dog is admiring. Mostly. These scarves are fun and easy, if a bit time-consuming. Always more fun with fellow sewists! A few years ago I got a kit to make one, then made a bunch for my friends, who always wanted to know how I did it, so I posted a tutorial on flickr to try to show them. The photo above and below are both a part of the same set so click on either one, and stroll on through the album if you want to see more about these super fluffy — and warmer than expected — scarves. They drape beautifully, and it doesn’t matter so much if they shrink, which rayon tends to do. Plus it’s a great way to recycle rayon sarongs and other clothing you might be done with. If you plan to try a few on your own, I highly recommend investing in a chenille cutter first. I love the Olfa one but everyone swears by their favorite brand. You need one with a channel guide — preferably an adjustable or interchangeable one — and a way to rotate the blade angle when the blade gets dull. Which it will do, quite quickly. They look so different before and after washing, yes? Maybe that’s what Kona is staring at in the first picture :). Here’s one more pic, of Margret’s Juki set up on my worktable, getting ready to finish the channel stitching on the teal and orange scarf draped on the table. Gotta love those Jukis — they stitch super straight and fast, and have a thread-cutter built into the food pedal. We had the walking feet on both of them — and boy was it loud in the studio with both of them cranking! You can see my longarm in the background, holding a multitude of things (including some freshly minted scarves) on its frames while I ignored it for the day. Oh, well, even if I didn’t get any quilting done, I did get some Christmas gifts made! Hope your day was just as fun — or productive — or both! Ever hear of this scenario? Hell is where everyone is hungry. They’re seated at a long banquet table, full of delicious food, but the only tools they’re given to eat with are five-foot long chop sticks. Now. Imagine this. Heaven is the *same place*, except that everyone feeds each other. The art of cooperation in a nutshell. Above is a picture from a girls leadership camp my daughter and her friend attended this summer. 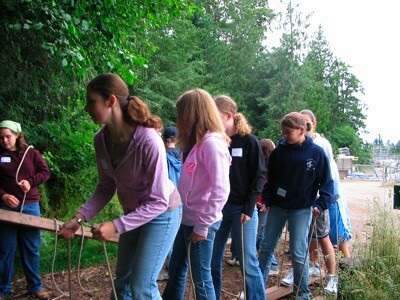 On the challenge course, set in the towering Olympic rain forest, their group of middle school-age young women learned the power of cooperation, and the strength they can draw from each other as a result. The organizers hope the cooperative skills they learned will be the foundation of a life-long habit. Many of the fiber artists I know have an instinctive grasp of the art of cooperation. They know the strength and inspiration they can gain from regularly meeting in groups. There are guild meetings for quilters, stitching sessions for embroiderers, and tutorials for knitters and crocheters. Some of the spouses I’ve met attached to fiber obsessed individuals are bemused but mystified by this necessity to gather ourselves in groups to share our obsessions whilst committing acts of fiber art. That’s right. We get together to share our compulsions, to encourage each other, to inspire and support each other in our creative outlets. But we don’t discourage the obsession with fiber of all sorts in any way. We might even expand the passion to include a new medium to express yourself in. So if you haven’t found a group yet, why not make one? Try collecting your favorite creative friends together for a meal, or just for coffee or tea and biscuits. Share your creative outlet with a friend and you may find you’ve lifted their spirits — and yours — in ways you couldn’t anticipate. I’ve been a voracious (okay compulsive) knitter for a dozen years now, and have taught hundreds of people how to knit. So it may not be obvious why I’m quilting so much at the moment. But there is a direct connection. Sort of. One of my knitting students, Leslie, happily took her skills to her quilting group in Seattle and slowly but surely turned the group into a knitting group with her passion for the craft. I was a regular member when I traveled into the city several times a week. They call themselves ‘Fiber Fiends.’ Of course. I’ve also been a member of a group called ‘Fiber Fairies,’ and I suppose ‘Fiber Fanatics’ would describe the group I’m currently in. Yes. The key word is FIBER. It could easily be suggested that the Fiber Fiends turned me into a quilter — just by association. 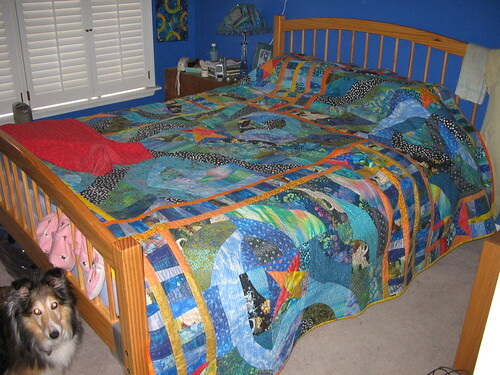 Leslie pursed her lips when glancing at the Tidepool quilt on my bed. “It must be something viral,” she said with a sly grin. She was of course relieved that I wouldn’t be pursuing quilting with the same compulsiveness that I have approached all the other fiber arts with. Ha ha. If it’s fiber, it’s in our house. Thread, yarn, fabric, raw wool and alpaca for spinning, batting, felt, and so forth, with of course the enticing embellishments like beads, sequins, buttons, angelina (fusible iridescent fiber, yum!) and of course glitter.